Is it possible to fix posture kamma issues? Looking to see if anyone else out there that may have recovered from a slouching posture might give me some tips. I slouch when I sit on a chair and when I sit to meditate. Please let me know where the following body parts should be if I was sitting in a chair-how do you do it? What stretches/exercises should be done to correct it? Whenever I try to sit up straight there is a lot of tension in my abdomen and chest and back, so I end it after a few minutes and slouch again. As a side note I do like to ride bikes - do you see half lotus or sitting cross legged as a knee injury inducing activity? Is sucking in my stomach required and if so is it ok to do all day/long periods of time? Re: Is it possible to fix posture kamma issues? I found some Yoga help to improve my posture. Please consult a professional before start this. TonyConrad wrote: Looking to see if anyone else out there that may have recovered from a slouching posture might give me some tips. The torso should line up straight with the natural curves of the spine in place. Not rigid or floppy, but rather relaxed and alert. TonyConrad wrote: What stretches/exercises should be done to correct it? Do you do any strength training for your core and back? It sounds like some of the muscles may be weak so doing some strength training for them will help. TonyConrad wrote: As a side note I do like to ride bikes - do you see half lotus or sitting cross legged as a knee injury inducing activity? It depends on how flexible you are. I injured my knee in doing half and quarter lotus because I wasn't flexible enough and forced myself. This was when I first started practicing and that initial enthusiasm blinded me into carelessness. Please don't make the same mistake I did. TonyConrad wrote: Is sucking in my stomach required and if so is it ok to do all day/long periods of time? I don't think it's required. If I find myself sucking in my stomach during meditation, it's usually because I've stopped being mindful and become tense and lost in thought. Strength training and yoga as said above are very good, if you can build your lower-middle trapezius, rhomboids and rear deltoids, these will pull your shoulders back and lift your chest. For slouching what has helped me a lot is alternating sitting and walking meditation (with hands touching behind my back). Start with 5-10 minutes each. I've done searches on the internet before, but this is much better! Thought I would also pass along some of this for you. It is from a Zen perspective, but still you might find something here helpful. "...bend forward so as to thrust your buttocks out, then slowly bring the trunk to an erect posture. The head should be straight; if looked at from the side, your ears should be in line with your shoulders and the tip of your nose in line with your navel The body from the waist up should be weightless, free from pressure or strain" from THE THREE PILLARS OF ZEN by Philip Kapleau. 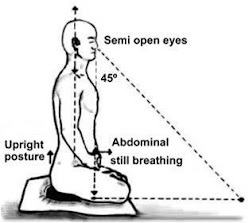 This applies to all the positions whether in a chair or sitting in any of the lotus positions. Seiza benches also help create a good posture. You might want to try one of those. I hope you keep us posted. I am curious to know how you progress!